My weekend was tempered by the sad news that my next door neighbour had passed away. I had posted about her awhile back when she was "missing". About a month ago Mr M across the street told us a "car had come and took her to hospital" but no-one had any other details. A couple of weeks ago the owner of a fast food place knocked on our door. Apparently our neighbour supported her shop four or five times a week and had not been in. She left me a phone number to call if I learnt anything. People were concerned but attempts to find out anything from the family failed. On Saturday a total stranger stopped us as we walked down our front path. She said she used to "play the numbers" with our neighbour and had heard she had died. That prompted me to check the death notices online and I discovered that she had passed away at the end of May. The sad task of telling the neighbours and phoning the shop-owner fell to me. The neighbours were saddened but were also overwhelmingly annoyed with the family for not letting anyone here know what had happened. Some of these people have shared the same street with her for the 15 years that she lived here. I felt really sad. She was a little eccentric but in a wonderful way. She told fascinating stories of growing up in the south. She had a crush on the manservant. No matter how many times the manservant told her to just stick any misdirected mail in our box she would ring the bell and have a little chat with him. She thought he was a little soft in the head because he would be outside in winter in bare feet and shorts! (I agreed with her). I will miss her knocking on our door asking us to ring her mobile number because she had lost her phone somewhere in her house. I will miss having a little giggle in my head at some of the things she wore. I never found out the name of the jeweler she paid to make lovely items. I never heard her play her old piano or the organ in her church. She was only 62 years old – I thought there was much more time to do all that. 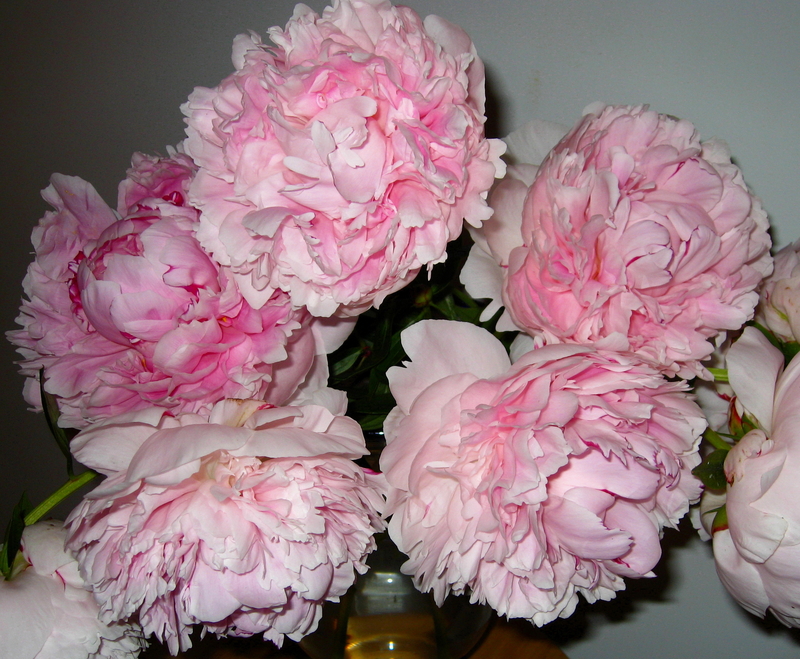 She once knocked on our door to tell me that her "heart was aching" because my peonies were lying on the path. I took scissors and cut them for her to put in a vase. She brought them back to show me how they looked in her vase – she was so pleased. 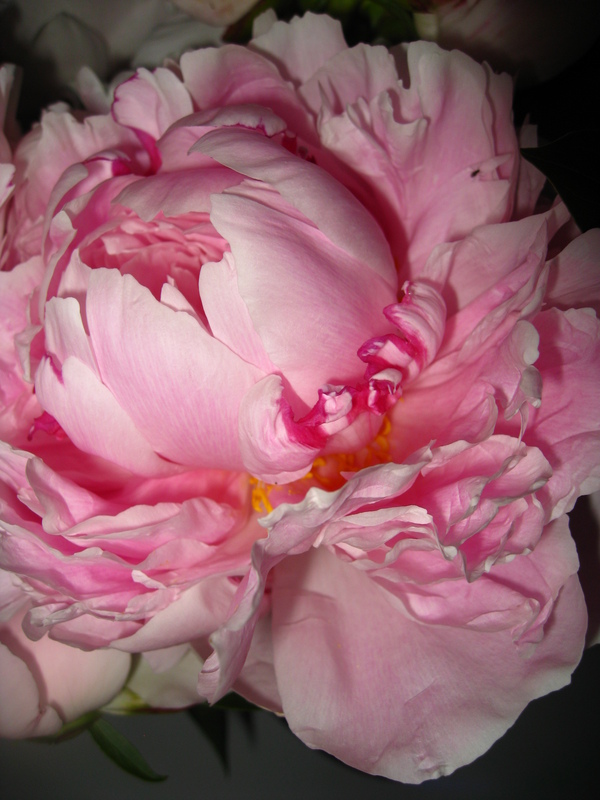 I did not get to give her any peonies this year – they were flowering around the time she was dying. I wish I had known which hospital. I would've taken a bunch to her. Farewell Sararietta - I will miss you. Thank you all for your concern for my neighbour. It is hard to know if to intervene when a person has family already looking for them. But, I am happy to report that Ms S is okay. She has lost her cell phone – the only phone she has. She didn't feel like going to work the other day and had no phone to call them. Tonight she is sitting in there with her television blaring so loudly it is almost vibrating my walls! She thinks she was just having an early night when her niece came knocking…….. Thank goodness she is suffering from deafness not deathness! About 8.30 last night I was watching television when a lot of banging on my next door neighbour's door disturbed me. It was prolonged and loud. I decided to put my telly on mute and pretend that I was not home incase they wanted to visit me next. Eventually they went away without trying my door. About 45 minutes later the banging was back and even more frantic than before. Okay – now I thought I should check things out. I opened the door to find a youngish woman peering through the letter slot in the neighbour's door. I asked if everything was ok and she explained that she is the niece of our neighbour and that she was concerned because Ms S had been sick and her work had called (the niece) because Ms S had not turned up. I replied that the last time I had seen Ms S was on Monday. I noticed a chinese restaurant menu stuffed in her door jamb and thought that they had been delivered on Tuesday so the door had not been opened since then. I suggested she try banging on the back door as Ms S might not hear the ruckus if she was at the back of the house especially if she was upstairs at the back. She went away but I did not hear any knocking out the back (and I was listening for it). I started to wonder why Ms S's son did not come to check – he has a key. Ms S had given her cell phone number to us recently to call as she had misplaced her phone in her house and would be able to locate it by following the ring. I tried the number last night but it went straight to voicemail. Our next door neighbour is not a lot older than me but seems elderly. She has so much "stuff" in her house that there is barely a path to walk through. She has Velvet Elvis pictures on her walls. Her favourite time to hang pictures and do minor home repairs is the middle of the night. She "mows" her front lawn with clippers whilst sitting on an upside down bucket. In summer she wears bicycle pants and a bikini top. She has a real fur coat . She has a little rat dog which is not allowed outside. She is a little strange and seems to have a crush on the manservant. I really hope nothing bad has happened to her. What a lovely day I had today. One of my vox neighbours, Maju, is holidaying in the DC area so we arranged to meet for brunch. We met at Panera Bread, one of my favourite haunts, back in my old neighbourhood. Maju brought a friend and we had a lovely time chatting and laughing. It was so nice to hear an Aussie accent and to have a few laughs at the differences between Aussies and Americans – everything from pronunciations to sense of humour. I am so glad that we arranged to meet. Going home, as I walked down my street, I noticed the elderly gentleman across the street sitting on his front porch so stopped by to say "hi". He invited me to sit and chat with him awhile. He grew up in Georgia on a "5 horse farm." He told me that he worked in a DC hospital for 52 years and 7 months and never had a sick day or called in late. He maintains that fresh air is the reason for his good health. He is looking forward to spring so he can get out in his garden. He loves sitting on the porch watching the world walk past. It was a pleasant half hour sitting in the afternoon sun listening to him talk. Sometimes human contact can really make a day nice! WTF – oh yeah – I've always wanted to write that but have never been really annoyed enough – but I've had a night's sleep to mull this over and I'm still annoyed! Last night just after 9.30pm a neighbour knocked on my door and said "did you know it's your responsibility to clean up the strip beside the sidewalk in front of your place?" I assume she means the nature strip bit between the sidewalk and the gutter. Admittedly the weeds are a bit high but the frontage is only 12 feet – I assume she must have parked her car right there somewhere in that 12-foot length and had some unpleasant experience trampling through the undergrowth to the path. I vaguely waved my crutches around and told her that the astro-dweeb will be back on Tuesday, then shut the door. This is a woman who chucks all her trash and unwanted items out in the alley!!! And, now suddenly at 9.30 at night, she is precious about the nature strip? I'm going to open a bottle of wine!